Throughout this food challenge there were times where I daydreamed a lot about pizza, burgers, ice cream, and other processed foods. But overall I didn’t have too much trouble suppressing my desires. Living alone makes this challenge easier since I have full control over what I bring home and will not be tempted by surprises in the fridge. 🙂 $29 per week works out to $125 per month. This is not a huge departure from the $150 per month I already spend on groceries throughout the year anyway. So I think that also helped make the challenge a bit more manageable in my particular case. But that being said, I normally also spend $50 per month on eating out, which makes my total food expenses $200 per month. All in all, I have learned a great deal from doing this challenge, like how to cook with a limited basket of ingredients. And I’m grateful to everyone who followed my one week journey and provided meaningful feedback. 🙂 Throughout this series of food related posts there have been many interesting discussions in the comments section. Regarding household budgets it’s good to keep in mind that food can be a very emotional and sensitive topic for many individuals. When it comes to expecting people on the internet to behave reasonably, it’s probably best if we don’t set our standards too high. Here’s a public conversation on Twitter about someone seeking financial advice that aptly illustrates my point. As with other budgeting challenges, this one saved me more time than anything else. I did my entire week’s of grocery shopping in one trip and didn’t spend any time going out for lunch or dinners. So unlike Gwyneth Paltrow, who gave up on the challenge half way through, I managed to make it all the way to the end. However, one week is a relatively short time to form a habit. And if I had failed the challenge, it would be no big deal. I earn more than $60,000 a year and was never facing any real risk of food deprivation. But unlike myself, those in poverty who depend on food stamps don’t have a large income to fall back on. And they live on a restricted budget for months, or even years. How Sustainable is Eating on $29/week? There are other factors that make it hard to know for sure if I could live on social assistance alone. Gwyneth Paltrow created this challenge based on the $29 per week the average recipient receives from SNAP. But this is a supplemental food stamp program so I don’t know what the actual total cost of food would be per person. Also, $29 USD is worth $37 CAD today, so it could be argued that Canadians should do the challenge using $37/week, which is more accommodating. Lastly, the cost of living in different cities also affect how much consumers can make a fixed budget stretch. I could save so much time in the morning if only I didn’t do this. Because your body is used to being fed sugar (aka carbs). A simple and delicious way to test if you are addicted to sugar is to eat some 100% dark chocolate; if it tastes bitter or yucky, you have a problem. Nice summation and how the challenge reminded you of something we might all take for granted and its value. There’s a portion of my mentality which never wants me to live in poverty, so I too would do almost anything to keep myself out of that situation. That test sounds like fun. I now have a good excuse to eat some chocolate. My lunch today alone was $10.45. I can never imagine living on $29 per week! But your meals seemed very fresh, healthy, and hit all the food groups. Did you notice yourself losing weight while on this challenge at all? I lost 0.4 lb. But maybe some of that is water weight. It’s hard to say. Maybe if I kept up this kind of diet for 3 weeks, it would show more of a change. I am glad you are still alive. I would have eaten the whole thing within 3 days. It sounds like you have a big appetite. 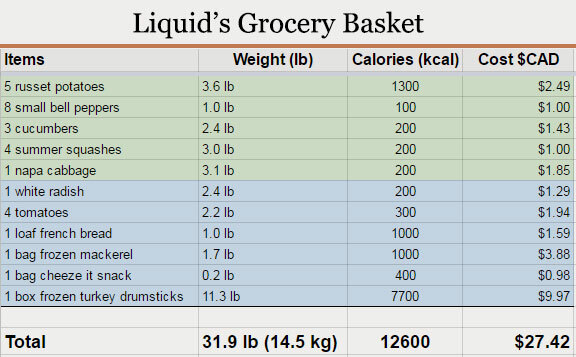 There was 32 lb of food in my basket to start. I wouldn’t be able to finish all that food in 3 days even if I tried really hard. It would be the equivalent of eating 7% of my body’s weight every day lol. You noted the exchange rate could mean that Canadians may have $37/week to do this. Another factor is the cost of food in the US being much lower than Canada for mean, cheese, dairy and vegetables THis is becuase of the economies of scale and the transport/distribution network in the states. US$29/week could go a long way in the States if one does it right. Yup. The population in Canada is so spread out moving anything around the country is more costly relative to the U.S. At least the cost of transportation and gasoline is still relatively affordable, for now. Those pics you posted were actually made by you? I’m impressed if so. Yup. I used photoshop to touch them up though. Thanks. I think learning how to feed ourselves is a pretty useful life skill, similar in importance to learning how to manage our money. One keeps us healthy, the other gives us the means to remain healthy and happy.